Barby Wilson surprises Grady Williams with the announcement of the Tom Edd Wilson and Grady Williams Lobby at Children’s Hospital Outpatient Center. Erlanger Health System representatives announced the new Children’s Hospital Outpatient Center lobby will be named after Grady Williams and the late Tom Edd Wilson for their unprecedented dedication and support to building a new Children’s Hospital in Chattanooga. 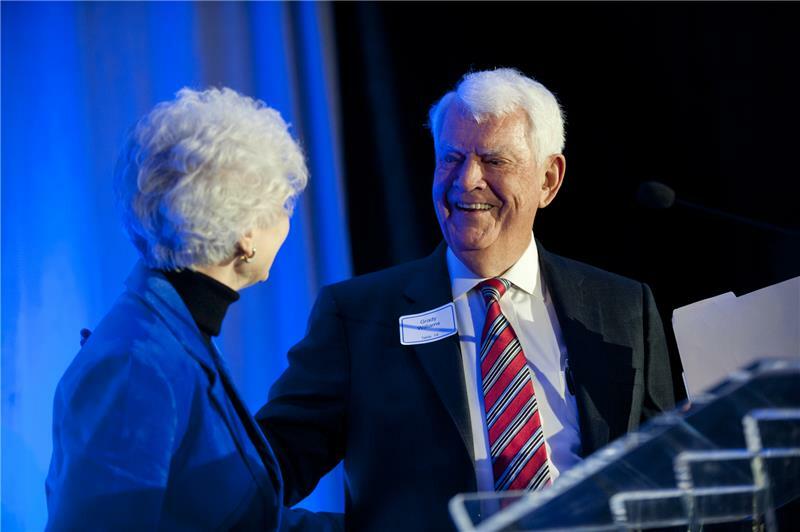 The announcement came during Erlanger’s 15th annual Dinner of Distinction honoring community leaders who have made a difference in the region’s healthcare. Presenting the Gordon Street Distinguished Leadership Award to Tom Edd Wilson’s family, Grady Williams gave a tribute to his friend and fellow co-chair for the Children’s Hospital Capital Campaign. Mr. Wilson’s wife, Barby, then approached the podium and surprised Mr. Williams by announcing the lobby will be named for both her husband and Mr. Williams. The new Children’s Hospital Outpatient Center on East Third Street is under construction and expected to be completed by the end of 2018. For more information or to make a donation to the campaign, visit webelieve.build.